Digital Optical Comparators compare parts to CAD data. 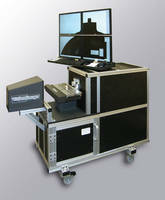 Combining capabilities of optical comparator, video CMM, machine vision, and vision system, VisionGaugeÂ® Optical Comparators produce operator-independent pass/fail result and display any deviation from specification by comparing part against bi-directional tolerances at user-specified control points. Available in 5, 10, 20, 50, and 100 X magnifications, comparators use machine vision tools to carry out pattern matching, color verification, and defect detection. SUDBURY, MA. U.S.A. - Methods Machine Tools, Inc., a leading supplier of innovative precision machine tools, has announced that they are the exclusive distributor of New VisionGauge® Digital Optical Comparators throughout North America. VisionGauge Digital Optical Comparators (Patent Pending), developed by VISIONx Inc. of Pointe-Claire, Quebec Canada, represent a breakthrough in noncontact comparative measuring technology. Methods will demonstrate, sell, distribute and support the comparators, which will be available at Methods Technology Centers and distributors. New to the industry, VisionGauge Digital Optical Comparators offer many advantages over conventional comparators, including the ability to digitally compare a part to its CAD data quickly and easily, at exceptionally high accuracy. This data can also be archived and documented electronically. In contrast, traditional optical comparators require Mylar overlay charts that are time consuming to use, less precise, error prone and difficult to document. VisionGauge Digital Optical Comparators will automatically produce an operator-independent "pass / fail" result, and display any deviation from specification by comparing a part against bi-directional tolerances at user-specified control points. VisionGauge Digital Optical Comparators combine the capabilities of an optical comparator, video coordinate measurement machine, machine vision and vision system. Similar to a CMM, VisionGauge Digital Optical Comparators produce highly accurate measurements in both manual and fully automated modes. The comparators feature an extensive set of machine vision tools to carry out pattern matching, color verification, defect detection and more. A very high resolution imaging system features detailed inspection of subjective properties, such as surface finish verification, digital image collection, annotation and electronic distribution. "By adding VisionGauge Digital Optical Comparators to our line, we are able to offer our customers a highly accurate, cost-effective and easy-to-use non-contact measurement solution that is significantly more accurate and versatile than traditional comparators," said Mr. Steve Bond, national sales manager of Methods Machine Tools, Inc. "Due to our existing customer base in EDM job shops and manufacturing plants in medical and other precision oriented industries, we are ideally positioned to distribute VisionGauge Comparators." "We are pleased to have Methods Machine Tools as our exclusive North American distributor of VisionGauge Digital Optical Comparators. Methods has extensive distribution coverage, a sterling reputation in the industry and a significant number of customers who can benefit from VisionGauge Comparator measuring applications," said Mr. Patrick Beauchemin, President of VISIONx INC.
VisionGauge Digital Optical Comparators are delivered shop-floor ready, are portable and are also equally suitable for the metrology lab. Fully digital, VisionGauge Digital Comparators efficiently collect complete digital records of inspections including images, measurements and other statistical data that are critical for Statistical Process Control (SPC) for documenting quality compliance. A wide range of powerful edge detection measurement tools produce sub-pixel accurate readings. Equipped with a barcode reader and joystick interface, VisionGauge Digital Comparators are extremely intuitive and require only minimal operator training. VisionGauge Digital Optical Comparators are exceptionally rigid. They feature a high-resolution megapixel digital camera and a low-distortion, wide field-of-view telecentric lens for capturing a high contrast and geometrically precise part image that can be easily viewed in full daylight. For easy part fixturing, VisionGauge Digital Optical Comparators include a hard chrome plated X-axis stage constructed of hardened tool steel and designed with dual standard dovetail grooves. Featuring VisionGauge® Online Software, VisionGauge Digital Optical Comparators project high- resolution video images from the camera, along with a digital CAD data "overlay", on a large quad-monitor display. Systems are offered in a small space-saving footprint of only 66" (168cm) long x 20" (51cm) wide. VisionGauge Digital Optical Comparators are available in industry standard 5X, 10X, 20X, 50X and 100X magnifications. The systems are also available in multi-magnification configurations. Systems are Windows-based and delivered network-ready in shop-floor convenient "rolling cart" set-up. VISIONx Inc. (Pointe-Claire, Quebec CANADA) specializes in automated image, visual inspection and high-accuracy measuring solutions. VISIONx develops, sells and supports software, systems and specialized hardware components for machine vision, image analysis, visual inspection, general detection and metrology. Methods Machine Tools, Inc. has been a leading supplier of precision machine tools and accessories for over 50 years, providing installation, parts, service, and training through a network of dealers throughout North America. For more information about Methods Machine Tools and VisionGauge Digital Optical Comparators, please contact: Mr. Steve Bond, national sales manager, Methods Machine Tools, Inc. 65 Union Avenue, Sudbury, MA 01776, TEL: (978) 443-5388, FAX: (978) 440-9405, Email: sales@methodsmachine.com or visit their website at www.methodsmachine.com. Eddy Current Comparator runs automatically after setup. Digital Optical Comparator utilizes LED technology..
Optical Comparator transfers data to PC for analysis. Digital Comparator includes temperature compensation. Digital Optical Comparator automatically verifies part-to-CAD data in real time.